The ComfortGEL line combines Comfort with Control and Performance. With the most comfortable grip in the garden, this ComfortGEL Cultivator is a handy tool when starting your garden. 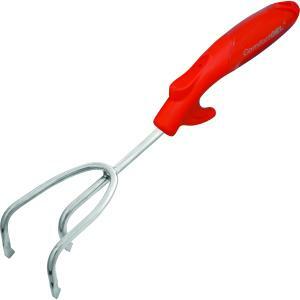 Made from stainless steel, its three prong head easily penetrates and digs through the dirt so you can get ready for planting. Ergonomic grips minimize hand stress with anti-slip thumb riser and finger guard for greater stability and control. Corona Tools has applied lessons learned from many seasons of field experience to create a series of gardening tools especially designed for your use. The large diameter, contoured and cushioned grips are comfortable for your hands. Their lightweight, quality built designs will not bend, break or rust.